After steadily focusing on acquiring new customers for much of the past decade, many B2B companies are realizing the often-overlooked need and opportunity to better engage existing customers. That’s why we partnered with Demand Gen Report on a new study, The Full-Funnel Effect: How Predictive Drives Value at Every Stage of the Revenue Cycle, to better understand the full customer lifecycle. According to the survey, 65% of marketing executives ranked customer marketing initiatives — including up-sell, cross-sell and retention — as a top priority. customer advocacy and generate greater revenue from current customers, it also revealed some substantial gaps in their current efforts and capabilities to move the needle beyond top-of-the-funnel programs. Marketers are increasingly confident about their capabilities to have an impact on the pre-funnel and top-of-the-funnel stages of the revenue lifecycle. An overwhelming majority (84%) take the lead when it comes to building brand and category awareness, and even more (88%) have mastered lead and demand generation. However, marketers say that when it comes to the middle and later stages of the funnel, their involvement and ability to have an impact declines. 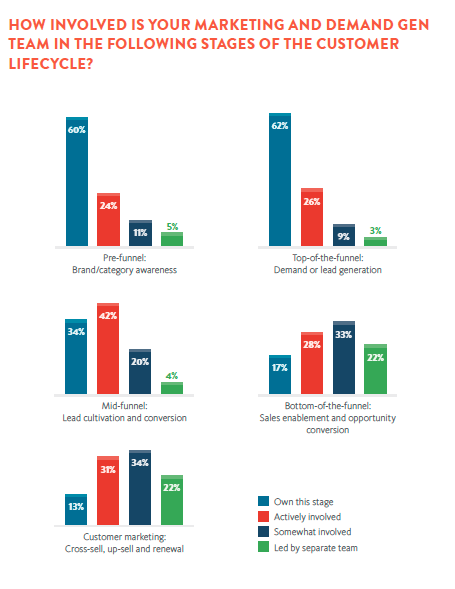 At the middle of the funnel, 76% say they influence lead cultivation and conversion. At the bottom of the funnel, fewer than half (45%) say they have an impact on opportunity conversion and sales enablement. Even fewer (44%) are actively involved in customer marketing activities. While respondents report that customer marketing is a top goal, they cite a lack of data and budget as some of the major hurdles to achieving the objective of customer up-sell, cross-sell and retention. More than half (51%) say there was insufficient data to support data and segmentation/targeting initiatives, and 50% cite a lack of marketing budget. On a positive note, three quarters are confident they have the skills and talent necessary to successfully market across the customer lifecycle. How marketers can use predictive technologies to increase advocacy and engagement with existing customers. Download the report now to learn more about the opportunity for growth within the full funnel.